The other day, I looked out our kitchen window and a neighbor was having a garage sale and lo and behold, sitting there was this beautiful shiny blue WALKER. I came to the conclusion early on that Dotty would die from her feet up. When did I first come to that conclusion? 2004. Dotty went to Heaven on May 25, 2012. About 19 days after she stopped walking. When I first came to care for Dotty in Delray Beach she was falling down almost every day, and she could not get up on her own. I cured that problem with the stand up sit down exercise in the gym. Dotty's legs weren't weak, she could leg press 30 pounds 36 times. I was determined that I would only put Dotty on a walker if there was no alternative. Dotty walked on her own until about 2006. I started holding her hand when we walked outside our home around that time. Around 2008 we started walking arm in arm. If I had read the comment, story, by Tumwatergirl below before Dotty died, I would have gone straight out the door and bought a walker. I'm certain I would have. Where do all those walkers go anyway? Tumwatergirl wrote this comment and reaction to the article, Alzheimer's, Self Concept, Self Esteem, 17 Cents, Walmart, which appeared earlier today. What a terrific story for two reasons. I have said previously that I teach paper crafting to a couple of groups of women. One of things we "create" are beautiful journals by covering and decorating Composition Books. I found these on sale just before school a couple of years ago for 25 cents each at Walmart. "Wojo Edwards", lol, they are normally about $2.00 so I bought a shopping cart full and I still have shelves of them ....woo hoo! Your main reason for the story hits close to home for me because we also live very close to Fred Meyers ( a one stop shopping store) and instead of having a mother following me around the store, I have a husband doing the same. Lately though it has been getting harder and harder for him. I had not even thought of the motorized shopping cart and besides, for my husband he really needs to keep walking as long as possible because of his pulmonary issue or he is subject to pneumonia. So I started giving him his own little shopping cart to "hang onto" and that has worked great. He, like Dotty, follows me around the store, and I even put half of my items into his cart and this really makes him feel like he is really helping. But, the other day, I looked out our kitchen window and a neighbor was having a garage sale and lo and behold, sitting there was this beautiful shiny blue WALKER. I ran over there so fast, I shocked myself. He sold me this walker for $5. 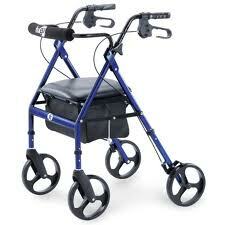 The walker has front and back hand breaks, a seat for when they need to sit and it is perfect. When I presented this to my husband, you would have thought I had given him the moon. He immediately took a walk down the block and back and his smile told it all. I next gave him a bucket of warm soapy water and a rag and told him to clean his new vehicle up and he sat on the deck, in the sunshine, with a smile on his face and spent an hour and a half even cleaning every inch of that vehicle. This past Saturday, our son took Jim to the Farmers Market while I was conducting one of my classes. Our son could not believe how energized his dad's walking was using this walker. They also bought a flat of fresh blueberries and fresh raspberries and were able to put the flats on the seat of the walker and continue looking around with ease.